I don’t know how many lists and tables in Excel i have seen the past few years. Some of them are real artworks and others just plain and simple. Somehow there is one type of table/list header that always makes an impression. I am talking about the lists with the diagonal headers. Aways wanted to know how people create these headers? Well follow the steps below and before you know it this one will be in your Excel tool belt as well! Why diagonal headers in the first place? 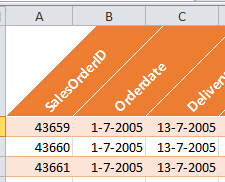 First step is to select the header row (only the cells that contain data please! you don’t need the entire 16000 cells in row one). 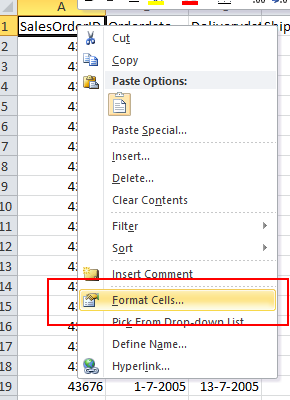 With the first header row selected right-click and choose format cells from the menu. You will now see a familiar dialog pop up. 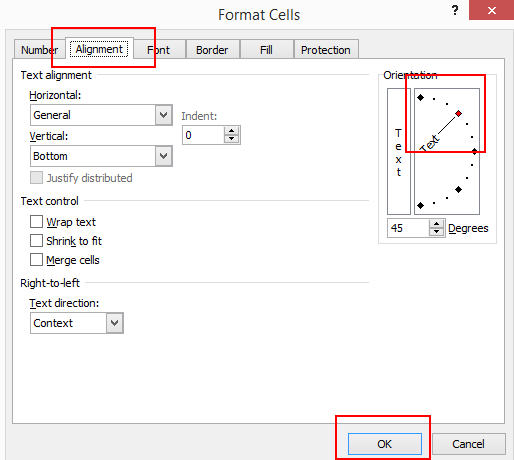 Select the second tab ‘Alignment’ and set the orientation to 45 degrees. just drag the red dot… ( as shown in the image). Now we set some nice color by choosing the cell style color. But wait that is not what we are after? Nope we have to adjust it a little more. Make sure the header is still selected. Now open the cell style menu once more. Now choose the first option under the Data and Model group. I chose calculation. Now you see that your color will change to the cell style you have chosen. Don’t panic you can reset the color later to the color of your liking. But he, it is starting to look the way I want it 🙂 Now for some final adjustments choose the color style you had before. The headers will stay diagonal and your color is applied. Users still want to filter their data remember…. As a final touch make a table out of this list. Easy thing is just to go to the table style menu under the ‘Format as Table‘ button. Choose one of your liking and make sure the header row is also in the selection area. You now have a fully functional table with filter possibilities with diagonal headers! Adjust column widths and you are good to go. Lists anyone? This entry was posted in Excel and tagged cellstyles in Excel, corner table heading in excel, diagonal headers, diagonal headers in excel list, Diagonal headers in Excel table, header row, headers in list on January 6, 2015 by Maurice.